Of 42 assaults reported between 2016 and 2018, only five have resulted in arrests or charges, according to CT Transit. With concerns growing about assaults on CT Transit bus drivers, the drivers are now looking to Washington, D.C. for protection. Connecticut bus drivers are urging the state's representatives in Washington, D.C., to support a measure aimed at better protecting transit workers from assault and other dangers on the job. It is an issue that NBC Connecticut Investigates has been looking into for more than a year. "If I were them, I would be the first one to sign that bill," said Jasmin Rivera, who has been a CT Transit Operator for about five years. "We get sexually harassed. We get threatened. We get spit on," Rivera said. Surveillance video obtained by NBC Connecticut Investigates showed passengers spitting on bus drivers time after time. The videos also showed food and drinks being thrown at drivers and even a passenger punching a driver in the face. Of 42 assaults reported between 2016 and 2018, only five have resulted in arrests or charges, according to CT Transit. The incidents were documented in reports filed with CT Transit by the drivers themselves. "You never know what you're going to get," said Rivera. There is new hope that bus drivers in Connecticut will soon be getting some new protections from Washington, D.C. There is growing support from federal lawmakers for the Transit Worker and Pedestrian Protection Act. If signed into law, for the first time it would require local agencies, such as CT Transit, to report assaults to the U.S. Department of Transportation. Currently, there is no requirement that each assault be included in the department's National Transit Database. "This is incredibly under-reported," said Ed Watt, the Director of Special Projects for the Amalgamated Transit Union in Washington. Watt said this potential change in law would shine a new light on a the dangers drivers face. "It needs to be brought to attention, otherwise it's just going to increase," Watt said. The proposal would also require agencies to construct physical barriers around bus driver seats. CT Transit told NBC Connecticut Investigates last year that the bus company would be launching its own barrier pilot program. This week, Cole Pouliot, General Manager of CT Transit, said that only one bus has been equipped with a barrier so far. Local union members said they received a memo sent April 5 from CT Transit management in which bus operators were told that there is a plan for 100 buses to be retrofitted with driver barriers sometime this year. CT Transit also plans to offer further safety and deescalation training for bus operators, according to the memo. NBC Connecticut Investigates requested further details about the contents of the memo but CT Transit has yet to respond. Legislative action at the federal level comes at a time when more violence has occurred on CT Transit buses. Newly released CT Transit surveillance footage shows a passenger using a cane to beat a driver on a bus in Hamden on March 4. 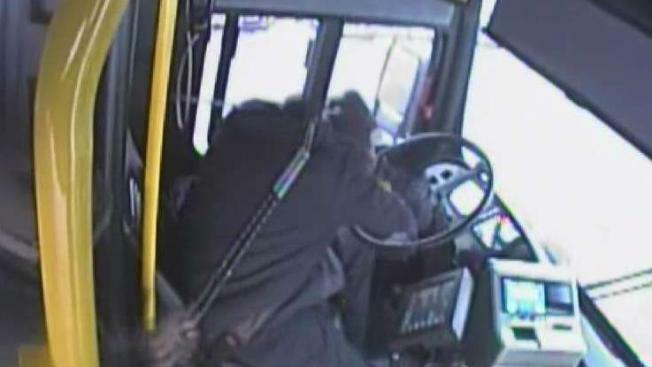 The driver is seen struggling to unbuckle himself but then fights back and gets off the bus. Minutes later, the driver reengaged the passenger outside of the bus, kicking him down onto the street, the video shows. The driver was terminated from his job and the passenger was charged with assault. Local union members say it is clear that more needs to be done to prevent incidents like these from escalating. "We're not asking for something special," said Artan Martinaj, Business Agent for the ATU Local 425. "We're asking to protect the public." Rivera, who is also a mother, said she wants the federal transit worker bill to move forward and that Connecticut's congressional leaders in Washington should be leading the way. "If somebody attacks me, what am I going to do to defend myself to make sure that she (her daughter) sees mommy at the end of the day," Rivera said. NBC Connecticut Investigates reached out to several of Connecticut's congressional leaders about where they stand on the proposal in Washington. More than 100 lawmakers are already supporting it. So far, none of the lawmakers are from Connecticut. For and updated list of cosponsors of the bill, click here.